AppMenuBoy 1.0 is a handy little application that takes away some clicks (and valuable time) to get an application opened. It also put your apps in a quick invaluable hierarchical list, so one can get to all apps in no time flat. 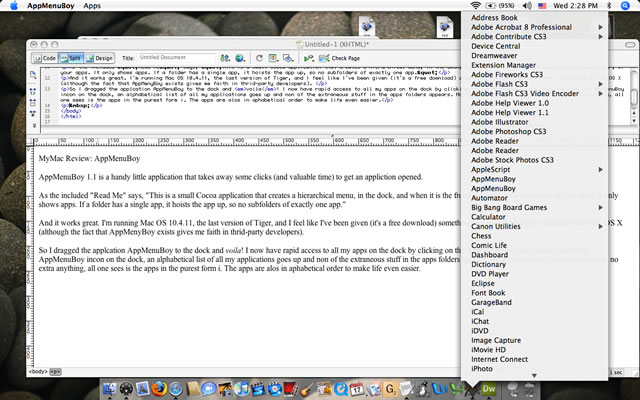 As the included AppMenuBoy “Read Me” This is a small Cocoa application that creates a hierarchical menu, in the dock, and when it is the frontmost app, in the menu bar, of your apps. It only shows apps. If a folder has a single app, it hoists the app up, so no subfolders of exactly one app. So I dragged the application AppMenuBoy to the dock and voila! I now have rapid access to all my apps. Holding down the AppMenuBoy icon on the dock, an alphabetical list of all my applications goes up in a menu and none of the extraneous stuff in the apps folders appears. No Read Me, no License Agreements, no extra anything, all one sees is the apps in their purest form. The apps are also in alphabetical order to make life even easier. So go for it. It’s clean little program that does exactly what it’s supposed to do. And it could save you a lot of time.